Postal address: H-9600 Sárvár, Várkerület 30/A. Content is only available in Hungarian. 1. Benke, A., Cseke, K. & Borovics, A. (2011): Population genetic inventory of transdanubian Leuce poplars applying RAPD and cpDNA markers. Bulletin of Forestry Science, 1(1): 83-93. 2. Cseke, K., Bordács, S. & Borovics, A. (2011): Taxonomic and genetic study of a mixed oak stand. Bulletin of Forestry Science, 1(1): 95-105. 3. Cseke, K., Benke, A. & Borovics, A. (2011): Identification of poplar genotypes based on DNA fingerprinting method. Bulletin of Forestry Science, 1(1): 107-114. 4. Bordács, S., Nagy, L., Pintér, B., Bach, I., Borovics, A., Kottek, P., Szepesi, A., Fekete, Z., Wisnovszky, K. & Mátyás, Cs. (2013): State of Hungary’s forest genetic resources, 2010-2011. Bulletin of Forestry Science, 3(1): 21-37. 5. Cseke, K., Jobb, Sz., Koltay, A. & Borovics, A. (2014): The genetic pattern of oak decline. Bulletin of Forestry Science, 4(2): 135-147. 6. Mátyás, Cs. & Borovics, A. (2014): "Agrárklíma". Bulletin of Forestry Science, 4(2): 7-8. 7. Illés, G., Kovács, G. & Heil, B. (2011): High resolution digital soil mapping in the Vaskereszt forest reserve. Bulletin of Forestry Science, 1(1): 29-43. 8. Kovács, G., Illés, G., Mészáros, D., Szabó, O., Vigh, A. & Heil, B. (2012): Evaluation of changes of site parameters in the Noszlop forest district. Bulletin of Forestry Science, 2(1): 47-60. 9. Illés, G., Kovács, G., Laborczi, A. & Pásztor, L. (2014): Developing a unified soil type database for County Zala Hungary using classification algorithms. Bulletin of Forestry Science, 4(2): 55-64. 10. Illés, G., Kollár, T., Veperdi, G. & Führer, E. (2014): Forests’ yield and height growth dependence on site conditions in County Zala Hungary. Bulletin of Forestry Science, 4(2): 77-89. 11. Illés, G., Fonyó, T., Pásztor, L., Bakacsi, Zs., Laborczi, A., Szatmári, G. & Szabó, J. (2016): Results of Agroclimate 2 project: Compilation of digital soil-type map of Hungary. Bulletin of Forestry Science, 6(1): 17-24. 12. Illés, G. & Fonyó, T. (2016): Assessing the expected impact of climate change on forest yield potential in the AGRAGIS project. Bulletin of Forestry Science, 6(1): 25-34. 13. Illés, G. (2018): Predicting the climate change induced yield potential changes of sessile oak stands. Bulletin of Forestry Science, 8(1): 105-118. 14. Rédei, K., Rásó, J., Keserű, Zs. & Juhász, J. (2014): Yield of black locust (Robinia pseudoacacia) stands mixed with grey poplar (Populus × canescens): a case study. Bulletin of Forestry Science, 4(1): 63-72. 15. Janik, G., Hirka, A., Koltay, A., Juhász, J. & Csóka, Gy. (2016): 50 years biotic damage in the Hungarian beech forests. Bulletin of Forestry Science, 6(1): 45-60. 16. Berki, I., Rasztovits, E. & Móricz, N. (2014): Health condition assessment of forest stands – a new approach. Bulletin of Forestry Science, 4(2): 149-155. 17. Berki, I., Móricz, N., Rasztovits, E., Gulyás, K., Garamszegi, B., Horváth, A., Balázs, P. & Lakatos, B. (2018): Mortality and accelerating growth in sessile oak sites. Bulletin of Forestry Science, 8(1): 119-130. 18. Bartha, D., Berki, I., Lengyel, A., Rasztovits, E., Tiborcz, V. & Zagyvai, G. (2018): Estimated shifts of forest communities and tree species during changing climate. Bulletin of Forestry Science, 8(1): 163-195. 19. Manninger, M., Edelényi, M., Pödör, Z. & Jereb, L. (2011): Overview of the applied methods in the research of the impact of environmental factors on tree growth. Bulletin of Forestry Science, 1(1): 59-70. 20. Manninger, M. & Pödör, Z. (2014): Characterization of the temperature and precipitation condition of Zala County. Bulletin of Forestry Science, 4(2): 43-54. 21. Führer, E., Csiha, I., Szabados, I., Pödör, Z. & Jagodics, A. (2014): Aboveground and belowground dendromass in a stand of Turkey oak. Bulletin of Forestry Science, 4(2): 109-119. 22. Führer, E., Edelényi, M., Jagodics, A., Jereb, L., Horváth, L., Kern, Z., Móring, A., Szabados, I. & Pödör, Z. (2016): Effect of weather conditions on the annual basal area increment of a beech stand of old age. Bulletin of Forestry Science, 6(1): 61-78. 23. Hirka, A., Pödör, Z., Garamszegi, B. & Csóka, Gy. (2018): 50 years trends of the forest drought damage in Hungary (1962-2011). Bulletin of Forestry Science, 8(1): 11-25. Benke, A., Cseke, K. & Borovics, A. (2011): Population genetic inventory of transdanubian Leuce poplars applying RAPD and cpDNA markers. Bulletin of Forestry Science, 1(1): 83-93. Cseke, K., Bordács, S. & Borovics, A. (2011): Taxonomic and genetic study of a mixed oak stand. Bulletin of Forestry Science, 1(1): 95-105. Cseke, K., Benke, A. & Borovics, A. (2011): Identification of poplar genotypes based on DNA fingerprinting method. Bulletin of Forestry Science, 1(1): 107-114. Bordács, S., Nagy, L., Pintér, B., Bach, I., Borovics, A., Kottek, P., Szepesi, A., Fekete, Z., Wisnovszky, K. & Mátyás, Cs. (2013): State of Hungary’s forest genetic resources, 2010-2011. Bulletin of Forestry Science, 3(1): 21-37. Cseke, K., Jobb, Sz., Koltay, A. & Borovics, A. (2014): The genetic pattern of oak decline. Bulletin of Forestry Science, 4(2): 135-147. Mátyás, Cs. & Borovics, A. (2014): "Agrárklíma". Bulletin of Forestry Science, 4(2): 7-8. Illés, G., Kovács, G. & Heil, B. (2011): High resolution digital soil mapping in the Vaskereszt forest reserve. Bulletin of Forestry Science, 1(1): 29-43. Kovács, G., Illés, G., Mészáros, D., Szabó, O., Vigh, A. & Heil, B. (2012): Evaluation of changes of site parameters in the Noszlop forest district. Bulletin of Forestry Science, 2(1): 47-60. Illés, G., Kovács, G., Laborczi, A. & Pásztor, L. (2014): Developing a unified soil type database for County Zala Hungary using classification algorithms. Bulletin of Forestry Science, 4(2): 55-64. Illés, G., Kollár, T., Veperdi, G. & Führer, E. (2014): Forests’ yield and height growth dependence on site conditions in County Zala Hungary. Bulletin of Forestry Science, 4(2): 77-89. Illés, G., Fonyó, T., Pásztor, L., Bakacsi, Zs., Laborczi, A., Szatmári, G. & Szabó, J. 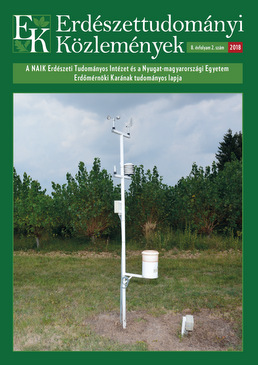 (2016): Results of Agroclimate 2 project: Compilation of digital soil-type map of Hungary. Bulletin of Forestry Science, 6(1): 17-24. Illés, G. & Fonyó, T. (2016): Assessing the expected impact of climate change on forest yield potential in the AGRAGIS project. Bulletin of Forestry Science, 6(1): 25-34. Illés, G. (2018): Predicting the climate change induced yield potential changes of sessile oak stands. Bulletin of Forestry Science, 8(1): 105-118. Rédei, K., Rásó, J., Keserű, Zs. & Juhász, J. (2014): Yield of black locust (Robinia pseudoacacia) stands mixed with grey poplar (Populus × canescens): a case study. Bulletin of Forestry Science, 4(1): 63-72. Berki, I., Rasztovits, E. & Móricz, N. (2014): Health condition assessment of forest stands – a new approach. Bulletin of Forestry Science, 4(2): 149-155. Bartha, D., Berki, I., Lengyel, A., Rasztovits, E., Tiborcz, V. & Zagyvai, G. (2018): Estimated shifts of forest communities and tree species during changing climate. Bulletin of Forestry Science, 8(1): 163-195. Manninger, M., Edelényi, M., Pödör, Z. & Jereb, L. (2011): Overview of the applied methods in the research of the impact of environmental factors on tree growth. Bulletin of Forestry Science, 1(1): 59-70. Manninger, M. & Pödör, Z. (2014): Characterization of the temperature and precipitation condition of Zala County. Bulletin of Forestry Science, 4(2): 43-54. Führer, E., Csiha, I., Szabados, I., Pödör, Z. & Jagodics, A. (2014): Aboveground and belowground dendromass in a stand of Turkey oak. Bulletin of Forestry Science, 4(2): 109-119.